Because springtime is hopping with homebuyers, there is more competition during that time of the year. In the Fall and Winter, you have a better chance of getting first dibs on newly released homesites and immediate deliveries than you would if you waited until the Spring. Beat the mad dash in April and May by bundling up and getting out now to visit our communities! With our brand new Your Way Homes program, there are even more ways to find your home, sooner. Unlike our standard immediate delivery homes, with Your Way Homes, we halt the building process at drywall and allow you to add the features and finishes you desire, such as hardwood flooring, countertops, and light fixtures. This allows you to personalize your home the way you have always envisioned, while knowing that your family can move in just 61 days later. Find yours now, and move in shortly after the holiday season! Our communities have beautiful qualities to them year-round, but we also know that the weather does not always cooperate here on the East Coast, especially in the winter. We recommend visiting our new home communities whenever it is convenient for you, and if the weather isn’t great, we know that you will still fall in love with the homes and locations we have to offer! It’s true – it is a slower time of year for the entire housing industry, but this means that you will be the center of attention! Realtors and other home-buying professionals will have more time to focus on you and your needs, which is also great for scheduling appointments and meetings around your other holiday-related tasks. Our last reason for urging you to visit us through the fall and winter, is that we have newly opened model homes waiting for you! We have just opened at West Village at One Loudoun, as well as our Knight House Square Townhome Collection at Embrey Mill! Keep up with all of our happenings and schedule a tour with us at millerandsmith.com. 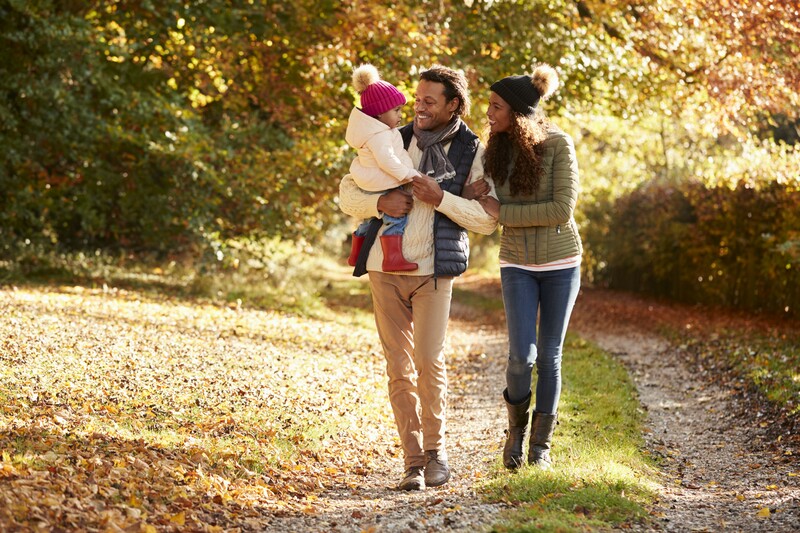 Reasons to Search For Your New Home this Fall! Another year means another perfect season to look for your new home. No silly, we aren’t talking about spring, we are talking about fall! Statistically speaking, spring is the most popular home buying season, but the fall season brings many added benefits to homebuyers who are in the market for a new abode. Miller & Smith builds homes year-round in a variety of new home communities so that you can find yours when it most convenient for you. Take a look below at a few reasons why the fall season is the perfect time to look for your new Miller & Smith home! No one can deny that the fall season brings about amazing weather in both Virginia and Maryland where all of our new home communities are located. While visiting any of our model homes (open 7 days a week), you will be able to observe every community in all of it’s beauty with the sun shining brightly and the foliage starting to peek through. Plus, you won’t be overheated, or very cold, while coming in and out of all of the model homes. Many families looking to move prefer to do so in the spring or summer months so that moving does not interfere with the school year. This is good news for your new home search, because there is less competition in the fall to get that exact homesite or QMI you’ve been looking at. If you are looking for a new home to move into before the end of the year, our immediate delivery options are for you! We currently have a great selection of ready-to-move-in homes in a handful of communities that are bound to suit you and your family. When there is less competition to find your new home, there is also less competition for necessary professional home services! Spring months are the busiest for services like landscaping, painting, interior decorating, etc., but in the fall, you will not have to worry about the professionals you want being booked up for weeks. You are more likely to get everything done for your new home when it is most convenient for you! Were you looking for a new home over the spring and summer but just couldn’t find the right one for your family? Here at Miller & Smith, we may have the exact answer for you! Over the past few months, we have held Grand Openings for three new home communities in Ashburn, VA! Our West Park Brambleton single-family homes, Garden District Brambleton townhomes, and Upper West One Loudoun Next Level Homes are sure to turn your search up a notch and you might just finally find a place to call home! Purchasing a new home is exciting, but you also have to think about purchasing things like furniture and smaller appliances to fill it! Fall is the best time to start looking for these types of items because there are some amazing sale prices that pop up towards the end of the year as we begin approaching the holidays. Luckily, all Miller & Smith homes come with brand new large kitchen appliances — one less thing to worry about! Taking advantage of the fall season to find your new Miller & Smith home is definitely the way to go. If you’re not sure where to start, head on over to our website to browse all of our new homes in Virginia and Maryland at https://www.millerandsmith.com!